Notes: The castle of Lucera is a castle located in the municipality of Lucera, in the province of Foggia, southern Italy, dating back to the 13th century. Currently only remnants of the castle and its walls are left.The construction of the castle was commissioned by Frederick II, Holy Roman Emperor following his decision to lead the Saracens rebels of Sicily in the town of Lucera, thus attempting to pacify the situation. The castle was built in 1233 on the foundations of a Romanic cathedral and the walls were added later (between 1269 and 1283) by Charles I of Anjou. This addition was necessary for the difference in use that he wanted to make of the structure: from imperial palace as was intended to fortified castle and permanent military garrison. The material of construction was mainly acquired from the remains of Roman buildings still present in the area. 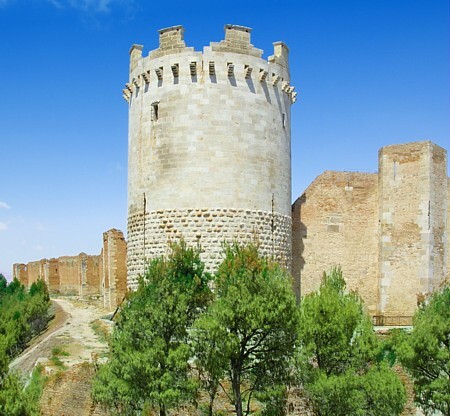 The castle, in fact, lies in the same place of the acropolis of the ancient Roman city. The complex was heavily damaged by an earthquake that struck the area in 1456, and was almost completely demolished in the 18th century to use the resulting material for the construction of the court. This ended in the 19th century, when the first restoration works begun.